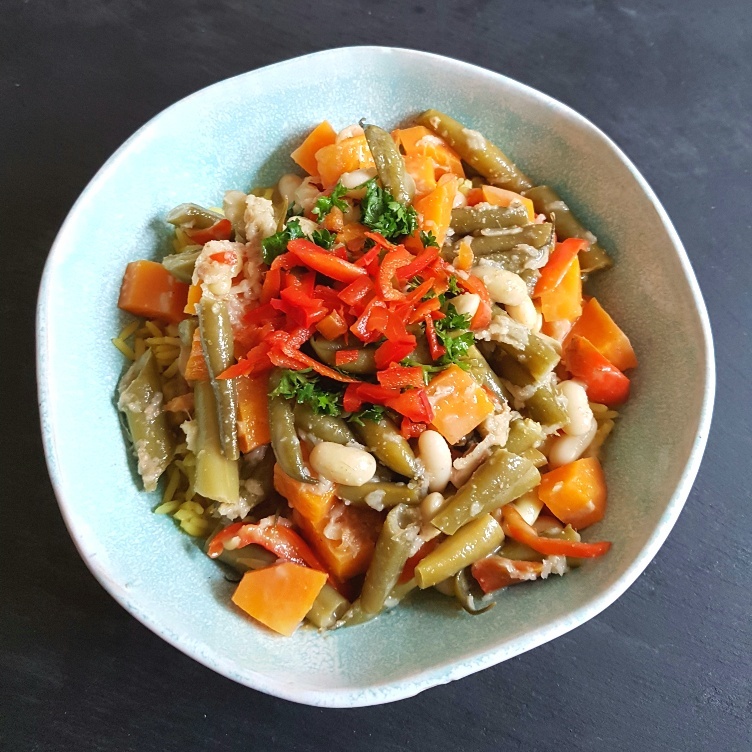 I developed this Thai green bean curry one day after my aunt and uncle had visited and brought with them a generous bundle of vegetable goodies from their allotment. Along with onions and turnips they’d brought us a stack of green beans which were so fresh that their stalks snapped with the slightest touch. I decided that a vegetable that good needed to be showcased as the star of its own show and this recipe was born. I’ve made a very tasty Thai curry before in the form of my Chicken Thai Green Curry, but I often think it’s a good idea to have at least a couple of vegetarian or even vegan meals a week because they’re a great way to incorporate fresh veg into our diets and they tend to be quite healthy overall. I also very much enjoy how light vegetarian or vegan meals can be because they lack the heaviness that meat-based meals can have. This Thai green bean curry is based around carrots, green beans and red bell peppers which are gently poached in a coconut-based Thai-style sauce. I like to serve mine with plain boiled rice because the Thai sauce is tasty enough that it doesn’t need any bells and whistles to enhance it any further. Also, although this curry only takes about half an hour to make from start to finish, you could cook this in the slow cooker throughout the day, if you like. Whatever cooking method you adopt you’ll be assured of a very tasty meal indeed! Prepare your vegetables, ginger, galangal and lemongrass as directed and place them in a large pan over a medium heat. Add the coconut milk, fish sauce, lime juice and spices and let it come to a gentle boil. Make your rice to go along with the Thai green bean curry. Once the vegetables are soft and tender, taste for seasoning and remove the lemongrass stalk before serving. Pour the curry over your boiled rice and scatter with the coriander or Thai basil leaves and fresh chopped chilli before serving.